You will now receive an email to confirm your registration. Here is where you will require your membership number. This is on your membership card. You will also need to enter your Postcode, Date of Birth and Telephone number. You are now ready to make a booking. Please contact us if you require any assistance with completing the above process. Online chat at the bottom of this screen is available. 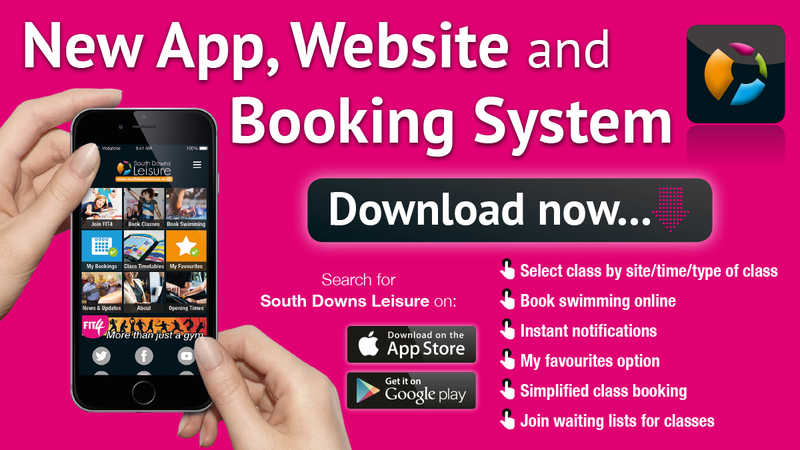 The brand new app is now ready – search the App Store and Google Play for South Downs Leisure. We are delighted to launch our brand new South Downs Leisure App. We hope you find this a much better experience for booking your classes, court/pitch bookings and swimming. There will be #App Champions across our centres whilst we launch the new app, booking system and website so please do ask if you have any issues. It’s great to say at long last #AppyDays for South Downs Leisure. All users will be required to create an account in order to use our new system. Enter your details with the email address that you will want to use to access your account. Click on the option, Link my membership. We listened to our users and so we have filtered the classes in to venue to make things easier for you. You will see there are five tiles, each for our centres. Click Add to Waiting List. If a place becomes available, all users who have been added to the waiting list will be emailed to say a place has become available. It will be a first come, first serve to book your space. App users can book swimming for members and non members in one hit. Please note that non members will be required to enter an email address in order for confirmation of your booking to be sent to you. Payment will be required at the time of booking for Centre Members and Non Members to secure your booking. Payment will be required at the time of booking for Centre Members and Non Members to secure your booking.